Festool saw blades are engineered and designed for cutting efficiency, long-life, and superior cutting results. 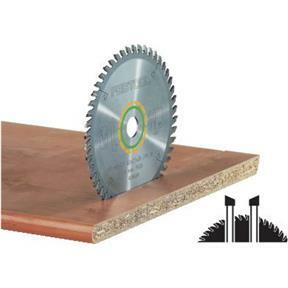 The carbide tipped Universal General Purpose blade for the TS 55 Plunge Cut Saw is a clean-cutting general purpose blade for wood and soft plastics, and serves as a fine-rip cutting blade for glue-ready joints.This blade incorporates an offset tooth design known as ATB (Alternating Top Bevel), allowing the blade to cut alternately to the left and right, generating a more efficient and cleaner cut in all types of wood. This thin-kerfed blade design meets less resistance, for more efficient cutting, and produces less material waste. Laser cut expansion slots reduce vibration for faster, quieter cutting. An oversized 20mm arbor enables more secure fastening of the blade to the saw, further reducing vibration for more precise cutting.